Yesterday I took some time to setup HANA Express Edition on my home-server environment. It would probably have been easiest to just install the VM image. SAP indicates that the VM image is made for VMware and VirtualBox, but doesn’t indicate how much Hypervisor-specific magic it added to this image. As I’m running XenServer at home, I thought I’d not take the risk and go with the binary download instead. I did feel confident that HANA would be running on my Xen hypervisor as HANA runs on Amazon and Amazon runs Xen. Hana Express Edition, use the download manager after registering: http://sap.com/sap-hana-express. In a discussion between Robin van het Hof and Thomas Grassl for TechEd Online, Thomas mentioned that the server only version would run in a VM with as little as 8GB memory. However, I intended to run the version that includes XSA features, which would require a bit more memory. The minimum amount of memory seems to be 12GB, so that is what I assigned to my VM. Disk space wise, 50GB would be enough. If the partition order is chosen smartly, this can be extended easily if the need arises. 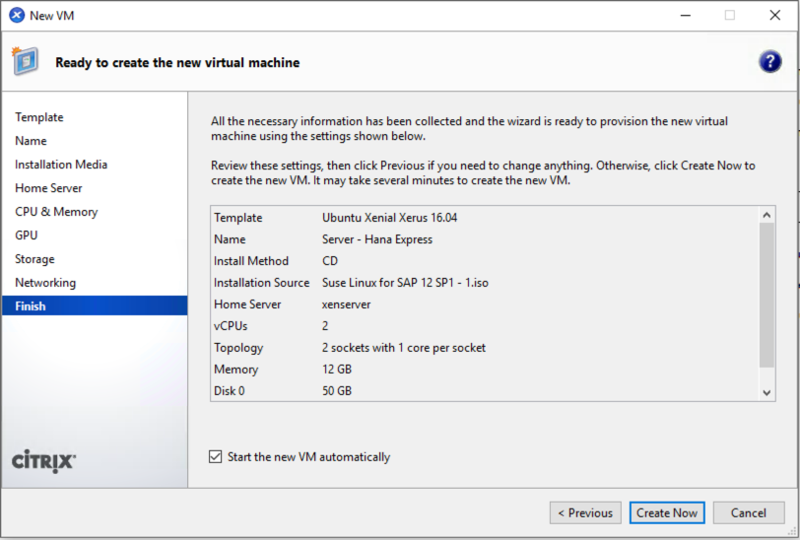 If you’re like me on XenServer, it’s better not to use the Suse template provided by Xen as it will create a para-virtualized machine and HANA will not run. Instead use e.g. “Ubuntu Xenial Xerus 16.04”, to make sure the machine will be a HVM guest. During installation registration is optional. At the time I was installing my instance, Novell’s registration servers didn’t accept my registration code, so I skipped this. Partitioning: partition 1: 2GB Linux Swap, partion 2: 48GB Linux Ext4. Default SystemD target: Text, as it’s going to be a server. Remove the “Gnome Desktop Environment” and “X Windows System” installation patterns. The “SAP HANA Server” installation pattern doesn’t need to be selected. Everything that’s needed is contained in the HANA Express download. After that, the installation can be started. Set the hostname. Mine get’s hostname hxehost through DHCP. 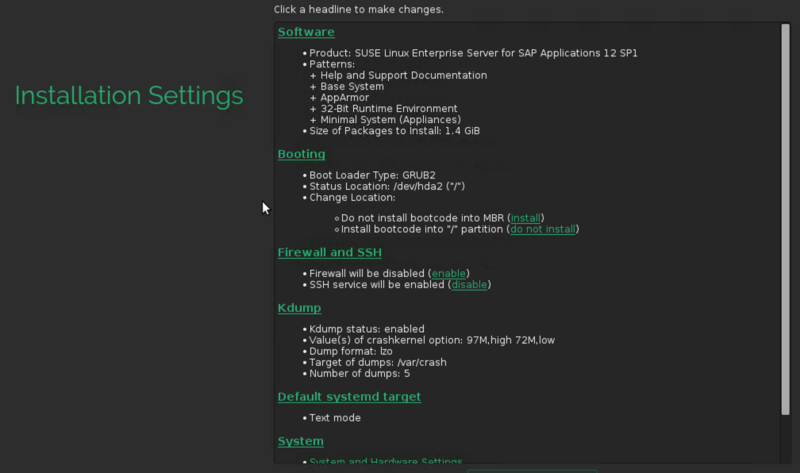 And there you have it, a nice foundation to get started with SAP HANA Express Edition.